This workbook, along with your coach, will help you develop an exit strategy so that you can walk away from the job with your head held high and your mind focused on the positive possibilities that await you in the next phase of your life. You’re leaving your job. You’re making a career move, going back to school, or perhaps retiring. Maybe your job has left you, and you’re being “downsized.” Regardless of “why,” in the near future you will be walking out the door of your organization or business for the last time. You are on the threshold. There are important things you can do to make this transition a successful one, no matter what the reason for the change, whether this is an exciting decision or a forced one, whether you’re thrilled or terrified. 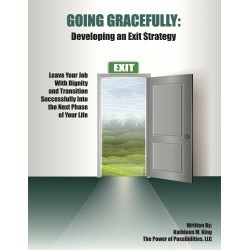 You can take concrete steps to “go gracefully,” so you can leave feeling positive, so you can go without burning bridges, so that if you’ve been with the organization for a long time, you can leave a legacy. This is a major step, a huge change and it can be overwhelming. Take the time to carefully consider the questions offered to you in this workbook. Take charge of your exit strategy.